Let me clear that up for you. 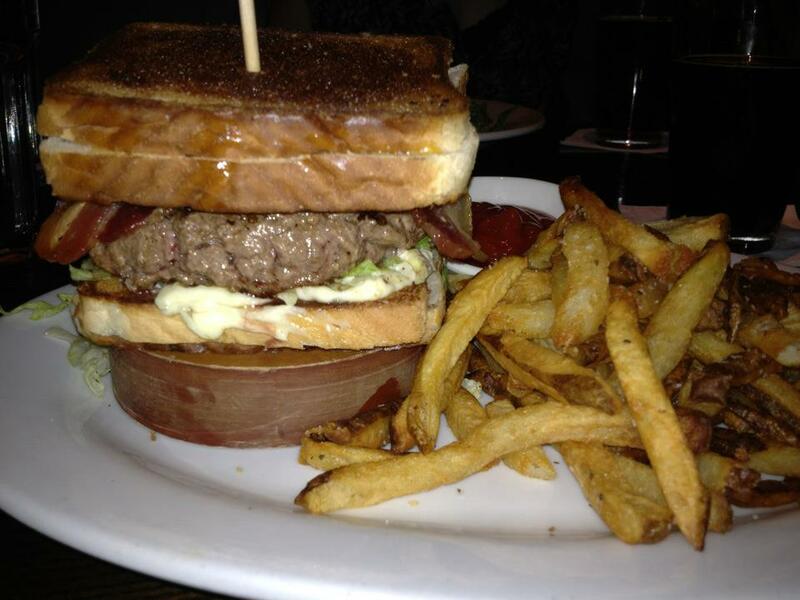 I can sit there and watch you eat a greasy 1/2 pound burger stacked between two bacon-stuffed grilled cheese sandwiches (The Lucky Monk). It doesn’t faze me or upset me. I will not pull out my PETA gear. Do what you will. I gave up meat for lent one year (I’m not really a religious follower, but rather chose to test my willpower). When lent was over, I ate a piece of chicken. It was tasteless and dry. The texture of the skin against my tongue was abnormal. So I started to avoid eating meat. During a trip to Australia with People to People at age 12, I went on the Vegetarian meal plan. And finally, when I came home from my trip, my parents took me to Steak and Shake (open late with better quality than McDonalds) and I demolished an entire hamburger meal. It was mouthwateringly delicious. I haven’t eaten meat since. My choice. Some people’s bodies start to react in a negative way when they give up meat, making them violently ill. I skipped this step, and would now become extremely sick from eating any meat form. That’s my “why” story. To clarify, I eat dairy. Those who refuse to eat anything from an animal are Vegan. Those who eat eggs, milk, cheese, etc. are Vegetarian. Recently, I figured out I am allergic to wheat. It was a year-long process of constant bloating and swelling, pelvic/abdominal pain, nausea, no desire to eat and basically an interruption of my normal life. When drinking alcohol (mostly beer), I my fingers noticeably swell within the first few sips, and I actually have to take my rings off. Hospitals, doctors, specialists, scans and blood work all said, “You’re fine. Normal.” But I didn’t FEEL normal or fine. I even stopped working out; that hurt. Then stopped wearing jeans; they were uncomfortable. When I tried to Google what other people’s symptoms of Celiacs or a wheat allergy were, it was next to impossible to pinpoint one significant factor that would definitely say that was my problem. So I am putting this out there for anyone searching and wondering what it’s like. I finally went back to the doctor for the millionth time and asked her to take a blood sample that diagnoses Celiacs and she told me to go gluten-free for two weeks to see what happens, and then sent me on my new journey. I’ve been pretty symptom free along the way. There’s a lot of label reading involved, and there is surprisingly still a lot of available products that don’t contain wheat or gluten a vegetarian can eat. The best part is that we are in the day-in-age of technology. If I’m unsure about some food, I can Google search direct from my phone and check if it is gluten-free. The hardest two parts are remembering I can’t eat wheat products and deciphering what a restaurant has used to make their food. I went out to eat for lunch one day, about a half hour later my hips were burning. Yes, burning. I scrambled to remember every detail of what was in my house salad. Croutons. Later that night, I was out with a friend from college who bought a round of whiskey shots. Come to find out, most whiskey is distilled using wheat, but can also be made using barley, malted barley, rye, malted rye and corn. That mistake was followed by the trip back home stop to Taco Bell. 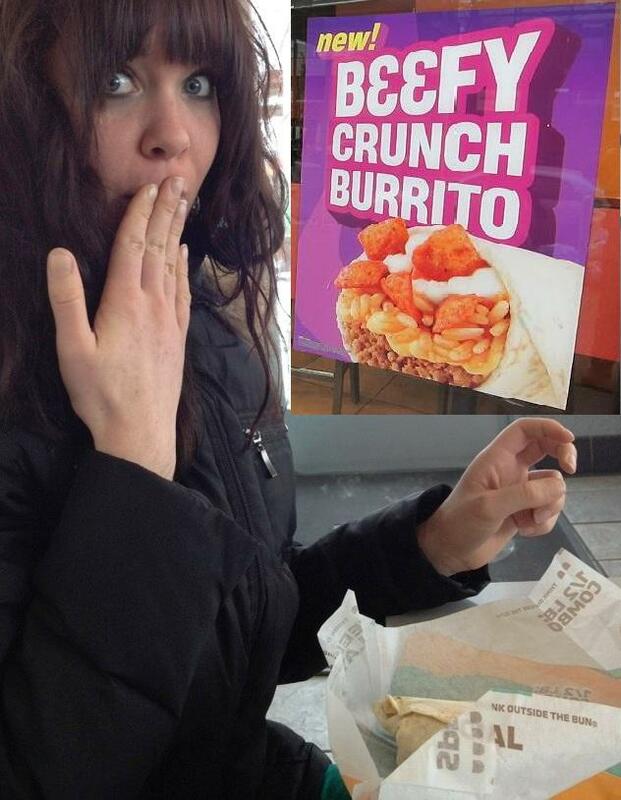 I’ve been quite intrigued by the beefy crunch burrito (obviously replace the beef with beans) for some time now. Ordered it, demolished half, then stopped and said out loud, “Ooooh. I can’t eat this.” So, I finished it. I had already started. But the Flaming Hot Cheetos flavored Fritos+1 flour tortilla was a big no-no. The next day I actually broke out in hives, solidifying my inclining that I was in fact unable to properly process wheat products anymore. So, I will do my best to mark all gluten-free recipes I make from here on out for those of you Gluten-free-ers looking for a new dish to try. Feel free to make suggestions below, or to comment and let me know if I am wrong in thinking a product is gluten-free. And to bring it back to The Lucky Monk, there are many restaurants out there now brewing a gluten-free beer! Also, to distinguish for you, it is my understanding that Celiacs is an autoimmune disorder causing a person’s body to attack their intestines. The villi are actually glued down by the gluten and the person is unable to catch the proper nutrients their body needs despite eating the right foods. An allergy to wheat is immediate. Your body reacts in the way any food allergy would. Hives, swelling, nausea are among a few. Feel free to leave any tips, suggestions or statements that a recipe I made and labeled gluten-free, is in fact, not.